The Flatiron Building, originally called the Fuller Building, is at 175 Fifth Avenue in the borough of Manhattan, New York City. It was one of the first skyscrapers. When finished, in 1902, it was one of the tallest buildings in the city. The building sits on a triangular island-block. Most Manhattan streets are on a strict grid plan but Broadway is an exception. It crosses the streets and avenue at an angle. This makes it cut across Fifth Avenue, a large and important road running N/S. At the junction sits the Flatiron on a triangle of land. There are also two E/W roads, a main road, 23rd St. and a minor road, East 22nd St. The name "Flatiron" is because it looks like a old-fashioned cast iron clothes iron. The building has been called "[o]ne of the world's most iconic skyscrapers, and a quintessential symbol of New York City". It gives its name to the neighborhood around it, known as the Flatiron District. It has become an icon of New York City. The building was designated a New York City landmark in 1966. It was added to the National Register of Historic Places in 1979, and designated a National Historic Landmark in 1989. 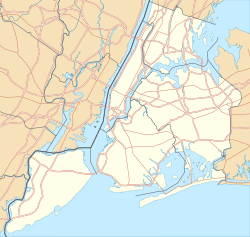 ↑ For its iconic status, see Koolhaus, Rem, Delirious New York: a retroactive manifesto (New York) 1978:72, and Goldberger, Paul, The Skyscraper (New York) 1981:38; both noted in this context in Zukowski and Saliga, 1984:79 note 3. ↑ Pitts, Carolyn (1989-02-09). " "Flatiron Building". National Register of Historic Places Registration. National Park Service. 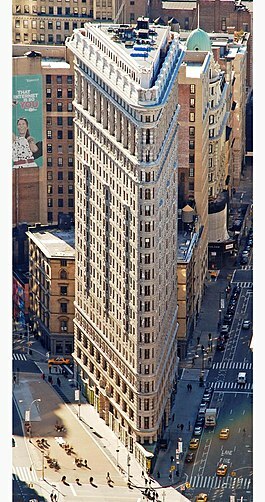 ↑ "Flatiron Building". National Historic Landmark summary listing. National Park Service. 2007-09-12. ↑ "Flatiron Building—Accompanying photos, exterior, from 1979" (PDF). 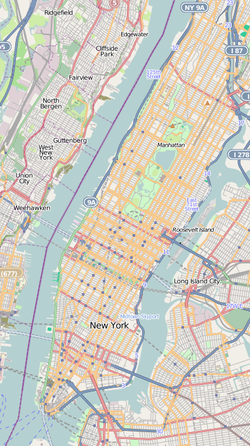 National Register of Historic Places Inventory. National Park Service. 1989-02-09. This page was last changed on 11 January 2019, at 21:23.